Let’s not bury the lede here. These lessons are free and open to everyone. No fees, no memberships, no signing up. You just park somewhere near Larsen Hall (the first building to the right as you drive onto campus from the West entrance on E. Colton Ave.), walk into the Meditation Room, grab a cushion or mat and a blanket from the rack and find a spot on the floor. Walk in, do your practice, smile at the instructor, and walk out. Yoga on Mondays, 8:30–9:30 a.m. This relaxed style of practice, led by Ian Wittenmyer, fosters a sense of connection with the present moment by placing emphasis on linking breath and movement. This class is for all levels. Gentle Yoga on Tuesdays, 5:15–6:45 p.m. This class, led by Mina Jain, is easy, effective, and enjoyable. No experience is required. Meditation on Wednesdays, 5:15–6:15 p.m.
Professors from the University, (Fran Grace, Pat Geary, Lorenzo Garbo) offer a sampling of the meditative arts from Zen meditation to Deep Relaxation (see below). Kriya Hatha Yoga on Sundays, 5:00–6:00 p.m. This class, led by Armound Mahmoudi, aims to introduce students to 18 particularly effective postures that have the ability to induce a deep physical and mental relaxation. The postures are taught in stages and the class is meant for mixed-level students who have the chance to do the postures to their best abilities. With all these options, there’s a lot of variety. For those seeking the most diverse offerings, the Wednesday class features three instructors, each specializing in a different type of class. During the spring semester, the class lineup includes: Introduction to Meditation (Jan. 10); Restorative Yoga (January 17, 24; March 7, 14; April 11); Mindfulness and Zen Meditation (Jan. 31, Feb. 7; March 28); Loving Kindness Meditation (Feb. 14); Centering Prayer (Christian) (March 21); Breath Awareness in Sufism (April 4); and Deep Relaxation (April 18). 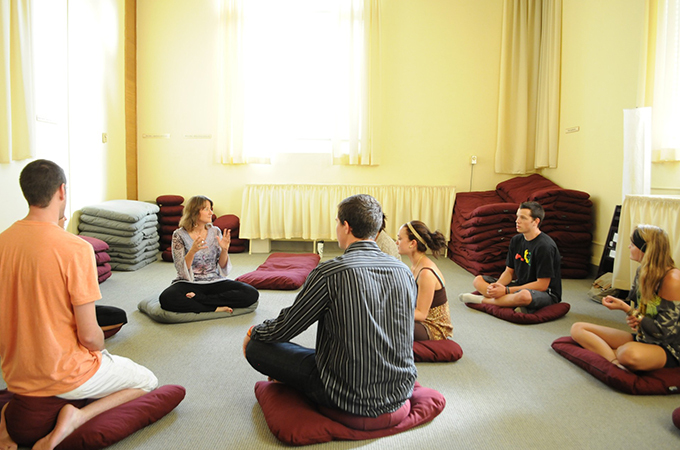 Also, on February 21, the Meditation Room Program will hold its 10th Anniversary Celebration as the first such program at any college or university in the country! OK, we’re biased because we work at the University. But we think your environment can influence your mood. Surrounded by the century-old neo-classical buildings with their pillars and domes, the huge trees shading your walk to the building, and multicolored landscaped gardens, the scenery might help you get in a contemplative mood. To make it easy to find these classes, here’s a map of exactly where Larsen Hall is and where you can park. The Meditation Room is Larsen Hall’s room 210. If you have any questions, email meditation_room@redlands.edu. We hope to see you in a class soon!